You’ve often dreamed about how great it would be to work from home -- no worrying about your wardrobe, no boss looking over your shoulder, no commute. For many people, that dream is becoming a reality. The home office has been a staple of self-employment for years, but even corporate employees are more likely to work from home, at least part of the time. 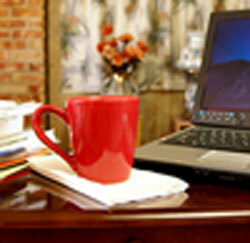 It is true that working at home can provide enormous benefits. But it also is easy to find yourself sitting home watching reruns of old movies and eating all day, or catching up on all the projects you meant to do around the house. So before you decide to accept a telecommuting assignment or set up your own business from your home, start with an honest assessment of yourself. What kind of support do you need? If you would have trouble doing your job without the services of your assistant or without access to resources available only at the office, you may not be a good candidate for working from home. Remember that this is a real job. Whether you are in your home office or your corporate office, there are tasks you need to accomplish and expectations you need to meet. While it is true that you often can get a lot more done without the distractions of the corporate office, you won’t get anything if you don’t focus on doing your job. Talk to the rest of the people in your house. Your spouse needs to understand that you are working, which means you cannot be regularly called on for errands or watching the kids or even a little afternoon romance. Your children need to know that they cannot disturb you when you are at work. Be ready to make it clear, not only to your family but also to your friends, neighbors and the PTA, that even though you are at home, you are not constantly on call to help move furniture, do the laundry, let their dog out or help out in your child’s classroom. Set up a work space. You cannot actually work without a permanent work space, something more than a chair at the kitchen table. Your space should be separate enough from the rest of your house so that the activities of other people don’t bother you. Gather everything you need to work, such as computer connection, phone lines, fax, a comfortable chair, etc. Make your work space comfortable and inviting – a window is great, and add photos and music. Keep to a routine. Just because you aren’t punching a clock doesn’t mean you don’t have to be at work on time. As part of taking the job seriously, start work at a normal time. And try to knock off at a normal time, too. The flip side of having trouble getting started when you work at home is the tendency to work too long, cutting into the time you need for yourself, your family and other activities. Keep up old contacts. Working by yourself doesn’t have to be isolating. Get out for lunch with a colleague – you will find it good for your mental health and a good way to get the creative juices flowing or talk through a problem. Make new contacts. Join a networking group through your local Chamber of Commerce or other business group. You may find people who can help you grow your business or who can offer advice about working on your own. At the very least, you will find people to go to lunch with. Finally, realize that working at home is not for everyone. If you can’t make yourself finish what you need to get done or if you are going nuts without regular interaction with colleagues, then perhaps you would be better off going back into the office.